Earlier this week, the New York Times reported that a Facebook voter registration reminder, which sat atop users' News Feeds for several days in September, contributed to a drastic rise in online registrations around the country. That's not particularly shocking; this isn't the first time Facebook has nudged users to exercise their right to vote. It's also been proven that their "I Voted" button significantly boosts voter turnout on election day. 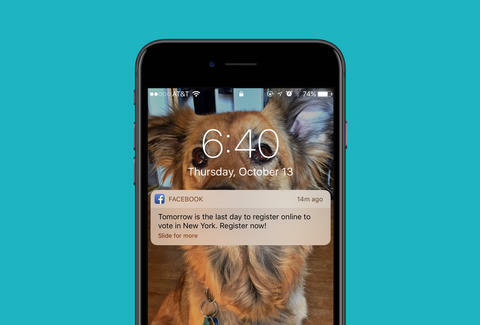 Now Facebook appears to be doubling down on its voter registration efforts, deploying push notifications to users a day before the deadline in their particular state. On Twitter, people in Washington, DC, Texas, New York, and elsewhere have been sharing screenshots of the messages that popped up on their phones. The notifications once again raise legitimate concerns about how Facebook could deploy such a message to certain users and withhold it from others, theoretically giving one party or candidate an advantage. If the company can directly affect who turns out to vote and where, it stands to reason that it's within their power to strategically tilt the election in a huge, unprecedented way -- and with no oversight or accountability. The direct push notification represents a much more aggressive approach to Facebook's political involvement. But what's really concerning is that these notifications require Facebook to geo-target users based on where they live. If the company is leveraging its metadata (in this case, your geolocation) to disperse this message, what's stopping Facebook from targeting you based on other metadata it has, such as your age, gender, education level, or political views? There are basically no restrictions on how Facebook chooses to wield the vast amount of data it has on us -- something we researched for a deeper story about Facebook's ability to rig the election and their potential motives to do so. To be clear, we're not trying to add any fuel to this dumpster fire of an election or float some half-baked conspiracy theory, but rather raise awareness around how much power and influence Facebook has over our opinions and behavior. In an era in which Facebook's algorithm serves up only the photos and news it decides we want to see, we should at least acknowledge the possibility that it could have its own agenda behind the scenes. Oh, yeah, and go vote please. Joe McGauley is a senior writer and resident conspiracy theorist for Thrillist.